Rintarō is surprised that Kurisu is alive, before being humiliated by her during a lecture concerning time travel. 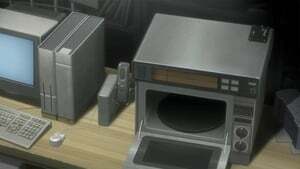 After getting some provisions from crossdresser Ruka Urushibara and meeting Suzuha Amane, who gets hired to work part time in the electronic’s shop below his apartment, Rintarō investigates the supposedly altered events and learns of a man calling himself John Titor who claims to be a time traveller. Rintarō then discovers the books he had on John Titor had disappeared as if they never existed. The next day, Rintarō encounters a strange woman named Moeka Kiryū who asks for information on a retro PC, which Rintarō gathers from Hashida. Later, whilst testing a banana on their microwave which then disappears, Rintarō and Hashida find the banana reattached to the bunch it came from in its gelled state, before Kurisu appears before them once again.